The winds of change are roaring in 2018, as recreational cannabis makes major strides in North America. Canada is set to be the first G7 nation to fully legalize recreational marijuana on a national scale. This will allow adults aged 21 and older to purchase legal cannabis and open effectively open the floodgates on a new, thriving market. Furthermore, as more U.S. states embrace medical and recreational cannabis, other states will continue to follow suit until Washington D.C. is forced to rethink its stance on cannabis. Make no mistake, legal cannabis on a major scale is very bad news for alcohol and tobacco companies that choose to not embrace the new growth market. Alcohol and tobacco sales have been in decline for quite some time, with tobacco increasingly being squeezed out. However, the alcohol industry has been much more active and supportive of the cannabis legalization movement in the past year. Faced with sagging sales and outlook, alcohol companies are making moves to secure their future, which is largely leaving “Big Tobacco” in the dust. According to a ten-year-long study conducted by two U.S. universities and one in Lima, Peru, alcohol sales were roughly 15% lower in states that had legalized cannabis. Breaking it down further, beer sales sagged 13.8%, while wine sales dropped 16.2%. There have been several major moves in the alcohol-cannabis crossover, but nothing has come close to the Constellation Brands, Inc. (NYSE: STZ) deal with Canopy Growth Corporation (NYSE: CGC) (TSX: WEED). In November 2017, the Corona beer parent company announced that it had purchased a 9.9% stake (for US$200 million) in Canopy Growth, one of Canada’s largest cannabis companies. On August 15, 2018, Constellation Brands announced that it will invest an additional C$5 billion (US$4 billion) into Canopy Growth, which will increase its total stake to 38% from 9.9%. This was a massive announcement that saw the Canadian listing of Canopy Growth surge 31.26% on the day. Another Canadian cannabis giant, Aurora Cannabis, Inc. (TSX: ACB) (OTCQX: ACBFF), has been active with the retail-side of the alcohol market after announcing a license agreement with Alcanna, Canada’s largest private liquor retailer. Aurora Cannabis paid C$103.5 million (US$82.5 million) to acquire a 19.9% stake in Alcanna back in February (which was called Liquor Stores N.A. at the time and has since changed its name to prepare for cannabis stores). 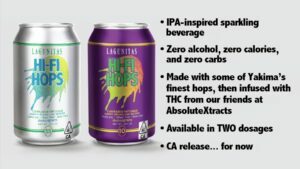 On July 30, 2018, Heineken N.V. (OTCQX: HINKF) launched Hi-Fi Hops, a cannabis-only sparkling beverage under its Lagunitas brand. The beverage will only be available in a few California cannabis dispensaries to start, but is expected to expand in the future. The beverage contains no alcohol and is currently only available in a 10mg THC version and a 5mg THC/5mg CBD version. Lagunitas Hi-Fi Hops is not cheap, however, with cost coming in at $8 per can. Back in January 2018, the Molson Coors Brewing Company (NYSE: TAP) (TSX: TPX) fully-acknowledged that there are concerns regarding the impact that legal cannabis will have on sales of alcohol drinks. In August 2018, Molson Coors Brewing announced that its Canadian business, Molson Coors Canada, has entered into a joint venture with The Hydropothecary Corporation (TSX: HEXO) to create a line of non-alcoholic, cannabis-infused beverages. It is important to note that the Molson Coors-Hydropothecary deal has been established as a standalone startup, which will have its own management team and board of directors. Molson Coors Canada will hold a majority controlling stake of 57.5% in the joint venture. Bigger alcohol and cannabis companies are not the only ones benefitting from collaboration. Vertically-integrated Canadian cannabis company, GTEC Holdings, Ltd. (TSXV: GTEC) (OTC: GGTTF) announced recently that it has appointed Mr. Lawrence Law to be GTEC’s Global Marketing & Branding Director. Mr. Law was previously the Global Brand Director for Diageo PLC’s (NYSE: DEO) Johnnie Walker Blue Label and Super Premium Portfolio. This gives GTEC Holdings, Ltd. an incredible boost in credibility for their premium craft cannabis brand, as Mr. Law has significant experience in the banking, luxury, technology, and automotive sectors. “We are very pleased to have Lawrence join our team. With GTEC’s focus on premium quality craft cannabis, we are confident that he will play a key role in the future development of our premium retail brands and products,” said Norton Singhavon, Chairman and CEO of GTEC Holdings, Ltd. 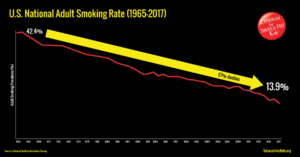 According to 2016 data from the U.S. Center for Disease Control (CDC), current tobacco smoking rates declined from 20.9% in 2005 to 15.5% in 2016 (per 100 adults) as efforts to raise awareness on dangers of tobacco smoking helped more people kick the habit. With that said, “cigarette smoking is the leading cause of preventable disease and death in the United States, accounting for more than 480,000 deaths every year, or about 1 in 5 deaths,” according to the CDC. The tobacco industry definitely has a lot working against it with public opinion beginning to shift, government anti-smoking campaigns, high taxes on tobacco products, and the fact that tobacco kills scores of people every year. We are watching the slow and painful death of the tobacco industry, which has largely continued to ignore the cannabis movement. Vaping products and the rise of tobacco alternatives has certainly helped stem some of the pain felt from falling sales in traditional products. However, new research has shown these tobacco vaping “e-liquids” are potentially as harmful for you as regular tobacco products. There have only been around three big moves in the tobacco industry with regards to an investment and acknowledgement that change is needed in order to survive in this new environment. In 2015, tobacco giant, Imperial Tobacco, shifted is business focus and identity. The company changed its name to Imperial Brand and then appointed the chairman of PharmaCielo, a Canadian cannabis oil extract supplier to the board of directors. Earlier this year, U.S. tobacco company Alliance One International, Inc. (NYSE: AOI) purchased a 75% stake in Canada’s Island Garden, a licensed medical marijuana producer and an 80% stake in Goldleaf Pharm, Inc., a medical cannabis license applicant. Goldleaf Pharm is in process of constructing an 1,850 sq. meter growing facility in Ontario. Tobacco giant, Philip Morris International, Inc. (NYSE: PM), has invested $20 million into Syqe Medical, an Israeli cannabis medical technology company. Furthermore, it was found that Philip Morris’ Switzerland subsidiary “holds a patent for improving GMO systems for growing marijuana.” Patent US20080281135A1 outlines a creation of GMO plants that yield higher terpenoid production,” according to the Cannabiz Journal. Overall, the alcohol industry has been far more intelligent when it comes to understanding the business risks that legal cannabis poses on an already slipping sales scene for boozy drinks. Understanding that the future hangs in the balance, breweries and distilleries have made aggressive moves to ensure that there is not only survival during legal cannabis, but also a thriving growth environment. Tobacco companies seem to acknowledge the risks associated with legal cannabis to the industry’s bottom line, but there has largely been an absence of deals. This will only hurt the tobacco industry further, as they will eventually have to shift into cannabis in order to survive. However, the longer they wait, the higher premium tobacco companies will pay for their cannabis exposure. In the end, it is a “tale of two cities.” Big Alcohol wants to use the cannabis wave to revitalize the industry, while tobacco companies seem to continue to be unsure of the future. The post Alcohol Companies Jump Onto Recreational Cannabis Bandwagon In Hopes To Revive Growth, Leaving “Big Tobacco” Largely In The Dust appeared first on Spotlight Growth.